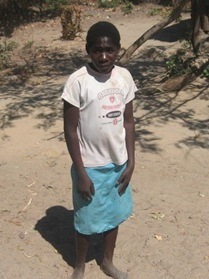 Elena Kwani is a girl aged 14, an orphan now in grade 6 at Brunnelli Upper Basic school. She comes from Shikambo village which is 7km from the feeding point. When her parents died, life became very difficult for Elena. Her schooling was interrupted because of hunger. Instead of going to school, Elena would wake up early in the morning to go and look for piece work in other people’s fields to earn money to buy food. Since Baraka Home-based Care began to work in Elena’s village, her life has changed. Through the meals and other supports provided by Baraka Home-based Care, Elena has been able to return to school. She has stopped working in other people’s field as she used to. She now concentrates in class and all the teachers are happy at her improvement. When she finishes school, she goes straight to the feeding point, where the food she eats gives her the strength she needs to walk to the school and remain attentive during her lessons. Thanks to a group of concerned Christians in the Chicago area, Hands at Work has been partnering with the community of Baraka since 2009 to mobilize and equip local Christians to effectively care for the poorest of the poor.